And so it was with Pfizer's acquisition of Allergan. The big splash from the 3rd biggest corporate M&A deal worth $160bn announced in November 2015 collapsed in April 2016 as a result of some arcane change in tax regulations. Pfizer's dogged determination to achieve a tax inversion can only be described as a fiasco and given, that this was the second time of trying, perhaps fiascos, is more appropriate. One can certainly sympathise with Pfizer and other large multinational companies with a tax base in the US where the corporate tax regime is not fit for purpose and where the dysfunctional political system means the politicians have completely failed to find a consensus and enact new legislation. The prospect of a divisive figure becoming president does not bode well for a consensus in future. Hopefully Pfizer have finally got the message from the US government and will now focus on developing its long term business as a leading pharmaceutical company rather than seeking a short term financial 'fix' to improve its financial results. Allergan must have known for some time that the Pfizer acquisition was likely to collapse because on the same day as the announcement, Allergan announced a $3.3bn deal with Heptares for early stage M1/M4 agonists for treating Alzheimers. The deal value is heavily back end loaded with 75% of the value dependent on milestones linked to sales performance and the upfront and R&D payments representing only 5% of the headline value. Two weeks later Allergan announced what is probably another back end loaded deal with the acquisition of Topokine for $85m upfront and undisclosed milestones. Topokine develops topical products for fat reduction and has a product in phase IIb/III for treatment of 'undereye bags'. (Did you know: 40m Americans suffer from this condition!) This product fits perfectly with Allergan's presence in the dermatology / aesthetics market but the Alzheimers deal is a surprise given the limited R&D Allergan has in that area and the high risk of failure. AbbVie is another company who “picked themselves up”. Like Pfizer, AbbVie was also wounded by a change in tax inversion rules forcing it to withdraw from its $54bn acquisition of Shire in October 2014. However within 6 months AbbVie announced the $21bn Pharmacyclics acquisition, won against competition from J&J. 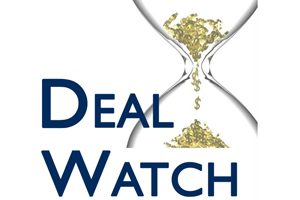 This month the AbbVie oncology deal wagon rolls on with the highest value deal of the month, the acquisition of the 'unicorn' company Stemcentrx for $5.8bn ($2bn cash, $3.8bn stock) plus $4bn in cash payments for success-based regulatory and clinical milestones. It is assumed that the majority of the $4bn milestones are linked to the four early stage clinical compounds in development also being acquired. Stemcentrx represents a good fit with AbbVie's oncology portfolio and is forecast to generate multibillion $ revenue. Its lead compound, Rovalpituzumab tesirine (Rova-T), is a biomarker-specific antibody drug conjugate, in phase I/II targeting cancer stem cell protein DLL3. Rova-T showed a 44% overall response rate in DLL-expressing small cell lung cancer (SCLC) patients who had failed one or more standard therapies. With argenx in Belgium, a co-development and option to license of ARGX-115 a preclinical human antibody program targeting the novel immuno-oncology target GARP, a protein believed to contribute to immuno-suppressive effects of T-cells. One of the interesting aspects is the comparison of the deal terms in these two preclinical deals. Both deals have similar upfront payments, the licensor leading the early development and the licensors having options to co-promote. However the argenx deal is an option not a license and has lower royalty rates. An option is usually less attractive than a license to a biotech company because an option does not give such a strong endorsement of the technology. Argenx may have been in a weaker negotiating position compared to CytomX. This is the first big pharma deal for argenx whereas CytomX has a track record of deals with Pfizer and BMS. Agrenx also has a shorter cash runway than CytomX. These factors give big pharma licensors the upper hand in negotiations unless they are in competition with other big pharma companies for the same asset. Every month there are deals that provide something to think about. For example one option deal this month is between Enumeral and Pieris. Under this agreement Pieris pay $0.25m to obtain a license to Enumeral's 388D4 anti-PD1 antibody programme. Within two months, Pieris either pays another $0.75m or the licence terminates. If Pieris pays, the development milestones are $37.8m and the sales milestones $67.5m. Pieris also gets a further 12 month option to another antibody programme and pays an additional fee if it is exercised. This arrangement suggests that Pieris may not have had full access to the confidential information regarding the technology and had to pay a fee of $0.25m for the privilege. Whilst the multiple options are interesting, the amusing aspect of this deal is the description of the royalty rates as “low-to-lower middle single digits”. Presumably this means 1% to 4%. It is amazing how companies tie themselves in verbal knots trying to describe the royalty rates without mentioning the number. Does anyone think that the disclosure of 1% to 4% is going to make any material difference to the opinion of investors or other interested parties? Another deal worth pondering about is the $265m exclusive license by AstraZeneca (AZ) of the approved Zurampic (lesuranid) plus a fixed dose combination with allopurinol for treatment of gout. Ironwood is paying $100m upfront for the US market plus $165m of milestones and “tiered single digit royalties”. The question is why is AZ not marketing the product? The reason according to AZ is Ironwood will ensure a successful launch of Zurampic in the US, “while allowing us to concentrate our resources on the innovative medicines in our main therapy areas”. Annual US sales of Zurampic are estimated by Ironwood at $300m so it seems strange AZ did not market the product using a contract salesforce if needed. In the last 4 years Gilead sales have grown from $8bn to $32bn (CAGR 40%), mainly driven by Sovaldi and Harvoni for hepatitis, resulting in a cash pile of over $20bn. In spite of this cash mountain, Gilead has not made any major acquisitions to maintain growth. The latest deal in early April was the acquisition of Nimbus Apollo for $0.4bn upfront plus $0.8bn in milestones. Nimbus develops Acetyl-CoA Carboxylase (ACC) inhibitors for treatment of liver diseases with the lead compound, NDI-010976 in phase I for non-alcoholic steatohepatitis (NASH - a hot area this month with deals by Regeneron, Madrigal and Tobira). The deal with Nimbus did not excite investors and they were even less impressed when Gilead reported first quarter results showing sales growth of 4% and full year guidance of $30bn sales i.e. less than 2015. As a result the share price dropped by nearly 10%. According to Reuters, the CEO of Gilead said "M&A is always a process," noting that Gilead has never said it would be unwilling to pursue a hostile deal, although "we do prefer a friendly process." This doesn't sound like a company aggressively seeking major deals. As usual, most of the deals this month are in oncology. Apart from the 3 deals by Abbvie, there were deals by GSK and Janssen with Zymeworks and Tesaro respectively. GSK must have liked working with the Canadian company Zymeworks because it is the second collaboration in less than 6 months. The collaboration provides GSK with a platform technology to develop bispecific antibodies. Zymeworks, like CytomX, have multiple Big Pharma partners including Merck & Co and Lilly. The upfront and preclinical milestones of $36m is similar to the AbbVie payments to CytomX and argenx all for preclinical development. At first glance it is surprising therefore that Janssen are only paying $85m ($35m upfront plus $50m equity representing < 20% of total headline value) for niraparib, a phase III molecule which Tesaro licensed from Merck & Co in 2012. The explanation for this is that Janssen are getting rights only for prostate cancer, not ovarian and breast cancer where the product is in phase III and the rights do not include Japan. Licensing one indication for a new product is unusual not least of all because of potential pricing issues if niraparib is launched by different companies at different prices. To deal with the development risk, Janssen has the right to terminate if there are any safety concerns or (without cause?) after 2 years from date of signature.